Two thirds of children under 6 in South Africa are still not receiving the crucial services they need during the most important period of their development. 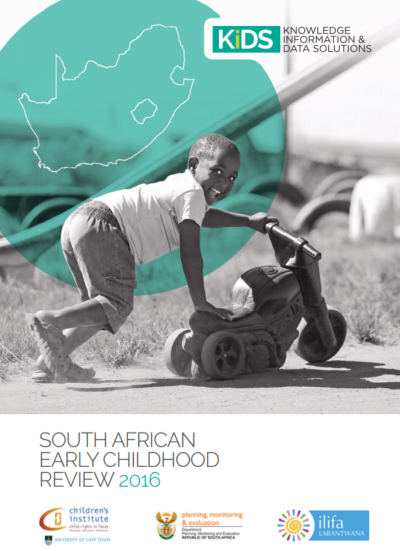 This is according to the South African Early Childhood Review – a first of its kind in South Africa annual publication providing data, analysis and commentary on over 40 statistical indicators measuring the progress of Early Childhood Development (ECD) service delivery across multiple government departments, including Health, Social Development and Education. The Review finds that close to 3 969 000, or 63%, of young children in South Africa live in poverty. Their development – including physical, cognitive, emotional – is compromised because they are not receiving the services and care they need. Provinces with the highest rates of child poverty are the Eastern Cape, KwaZulu Natal and Limpopo. The period of development from conception to age 6 is of crucial importance as the brain is growing at its fastest pace. The impact of the environment and care received during this time has a life-long impact on education and health; income earning potential; and even propensity for violent and risky behaviour. “Shortfalls in early childhood development are difficult to correct as time goes by. These children are always playing catch up and the education gap between them and their peers widens over time,” says Sonja Giese, executive director of Ilifa Labantwana – an NGO working to promote ECD, and co-author of The SA Early Childhood Review. “Some of the biggest improvements in terms of ECD services have been in the healthcare sector,” says Katharine Hall, senior researcher at the Children’s Institute, co-author of The Review. The percentage of children who are completely immunised by their first birthday has increased from under 70% in 2002 to 90% in 2014. There has also been a steady increase in early antenatal bookings (before 20 weeks in pregnancy), which is critical for ensuring a healthy pregnancy and baby. “This needs further improvement, however. Nearly half (46%) of pregnant women are still having their first medical check-up after the 20th week,” says Hall. Close to 75% of energy consumption in the first years of life is allocated to brain growth. In South Africa, stunting, caused by long-term insufficient nutrient uptake, is seen in over a fifth of children under 5. Stunting negatively impacts brain development and these effects are very hard to reverse. Vitamin A deficiency, associated with higher rates of infection and illness, is experienced by over 40% of South Africa’s children. Children can receive Vitamin A supplements in health facilities but the rate of delivery of this service remains low nationally; with Limpopo, North West and the Western Cape lagging the rest of the country. “Many of South Africa’s caregivers live in extreme poverty and face high levels of stress. They carry a huge burden of responsibility in a context where daily life is a struggle and there are multiple risks like shack fires, domestic violence and illness. In order to provide the best care possible for their children, caregivers themselves need information, psycho-social support and access to physical and mental health care services,” says Hall. “Both antenatal and postnatal depression and anxiety are huge problems, affecting an estimated one third of mothers,” she added. The Review has found substantial improvements in post-natal care for caregivers. Just 5% of women received follow-up care a week after birth in 2009; this had jumped to 74% nationally in 2014 although the Northern and Eastern Cape lag behind the remainder of the country. The Child Support Grant (CSG) has seen the highest rate of growth of all social grants in South Africa – it was introduced in 1998 and now reaches almost 12 million children. “The CSG has been shown to have a substantial developmental impact on children and their families living in poverty. Our challenge now is to ensure that caregivers access the grant as soon as possible after the child is born, so as to ensure that the child is able to benefit when it matters most. Grant uptake in infants remains well below the average – early grant enrolment, during pregnancy, could help to address this,” says Giese. The impact on later education is evident. The Annual National Assessments show that over 40% of children aren’t able to perform at the expected level in numeracy and literacy by the end of the foundation phase (Grade 3), and performance is poorest amongst the poorest. “The performance gap that we see at this early stage widens as these children progress through the schooling system,” says Giese. ECD was declared an apex priority by the National Development Plan. This was followed by Cabinet approving the National Integrated Early Childhood Development Policy in December 2015. “The National Integrated Early Childhood Development Policy, is one of the most significant commitments of the South African government to provide quality ECD services to all infants and young children,” says Zanele Twala, Director: Sector Expert Early Childhood Development at the Department of Planning, Monitoring and Evaluation in the Presidency. The full review is available for download here. The South African Early Childhood Review 2016 is a joint publication between Ilifa Labantwana, the Children’s Institute at the University of Cape Town and the Department of Planning, Monitoring and Evaluation in the Presidency. Really children are the society of tomorrow, so we have to care well and prepare them for the responsibility ahead of them! To understand their position these stats and reviews help. Thank you. Thank you – extremely useful information.